Bristol has seen a huge outbreak of measles this year, prompting the Council to remind parents about the importance of the MMR vaccine. Since January 2018, the city has seen 86 confirmed cases. They have also seen 20 probable cases. In the same period in 2017, the city saw just two cases of the disease. One reason for the rise in cases is young adults who missed out on vaccinations when they were younger. Bristol City Council - along with Public Health England - are urging parents to make sure children starting school in September have had two doses of MMR. The vaccine protects against Measles, Mumps and Rubella. Unfortunately, we know that the school environment provides a perfect place for infections to circulate and spread. This is why we are asking parents to add the MMR vaccine to their back to school lists. If you can't remember if your child has had the vaccinations or not, you can contact your GP who will be able to check your child's records. If you are young adult who isn't sure whether you had the vaccinations or not, you are also advised to ask your GP. A catch up vaccine can then easily be arranged. Cold-like symptoms including runny nose, sneezing and a cough. 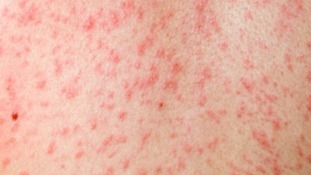 A red-brown blotchy rash, usually starts on the head or neck. If you suspect measles, call your GP immediately to be assessed and if it is measles stay at home until 5 days after rash has appeared. Call ahead before attending your GP, A&E or any other health care setting so that they make arrangements to prevent you spreading the infection to others.